BUTLERVILLE, INDIANA -- Dutch Brig. Gen. Hans Folmer, commandant of his country's newly-formed Dutch Defence Cyber Command (DCC), met with Col. John (Dave) Branch, commander of the 780th Military Intelligence (MI) Brigade (Cyber), to strengthen their partnership and to discuss cyber and future training opportunities at the Muscatatuck Urban Training Center (MUTC), Mar. 16. Folmer was at MUTC to observe how a cyber support team could enhance tactical operations for a Dutch Special Operations Forces (SOF) unit in the planning, preparation, and execution of a hostage scenario. The Dutch saw the end state of their BOLD QUEST 17.1 (BQ 17.1) exercise as the identification and experience of how cyber support can assist SOF and the development of SOF unit cyber capabilities. "Brig. Gen. Folmer is at the early stages of developing his force, and he is developing it in a reverse fashion to how the U.S. did," said Branch. "Here at Muscatatuck, he is initially looking at it from the tactical piece, but he is the all-encompassing representative to their defense minsters -- everything from the tactical to the strategic." Last June, Folmer wrote an article entitled "Defense Cyber Command: a New Branch to the Defense Tree." In the article, he discusses the current cyber threats, his country's updated Defense Cyber Strategy, and the implementation and organization of the DCC. Folmer believes digital resources are an operational capacity to be used as weapons or an intelligence agent, thus they are an essential part of the operational capability of the armed forces. He considers cyber capabilities as an integral part of military action, including offensive, defensive, and intelligence. Consequently, he sees the DCC's role as ensuring his tactical and strategic-level leadership support the military action with cyber capabilities. Following an After Action Review for BQ 17.1, Folmer told the Dutch element and Muscatatuck training team that, "One of the directions for the armed forces of the future is we're starting now to develop new units; a new way of (cyber) working with Dutch forces." To that end, Folmer and Branch's discussion focused on how the 780th MI Brigade can assist the DCC and its cyber force. Specifically, they discussed, "How do we train, how we assess our teams in training, and what can we share from a lessons-learned perspective in that set," said Branch. Branch compared the tactical training of U.S. cyber teams to what the Dutch were doing in the exercise. Branch remarked that the Dutch MUTC tactical training event parallels closely with what his teams have been learning from the National Training Center rotations in their Cyber/Electromagnetic Activities (CEMA) Support to Corps and Below (CSCB) efforts. "We can share those lessons learned, and there's CALL (Center for Army Lessons Learned) manuals, and then we've invited him to send some of his tactical force to partner up with ours and see where we can mesh," said Branch. "I think that's in the realm of the doable, especially with us, but more so even the Cyber Protection Brigade (CPB)…which seems to be his number one priority which is defense of the nation, at least in his early cyber effects." Partnering with the U.S. is important to the Dutch DCC commandant. 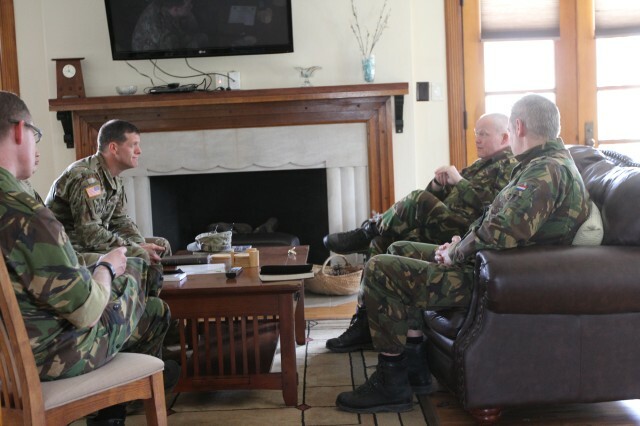 The Dutch have positioned a liaison officer, Lt. Col. Mark De Wolff, at the Cyber Center of Excellence (CCOE) on Fort Gordon, Ga. De Wolff regularly meets with the Cyber units there, to include the 782nd MI Battalion (Cyber). The 782nd is one of two cyber battalions subordinate to the 780th MI Brigade, headquartered at Fort Meade, Md. The 781st MI Battalion is also at Meade. According to Michael King, the 782nd MI Battalion Training and Exercise director, the Dutch are very interested in the training and certification process for the battalion's cyber teams. King's supervisor and the 782nd MI Battalion operations (S-3) officer-in-charge, Maj. Tom Nelson, stated, "Mr. King walked him through the T&EO (training and evaluation outlines) manual and we discussed our current 24-month training plan for FOC (Full Operational Capability) VALEX (Validation Exercise), and Recertification MRX (Mission Readiness Exercise)." 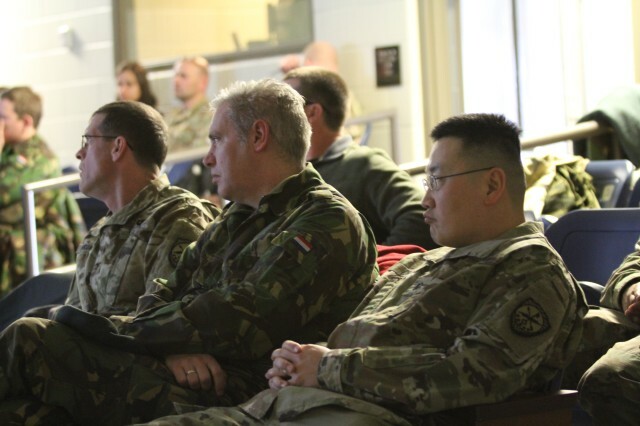 Part of the Dutch and U.S. partnership includes sending U.S. cyber Soldiers and civilians to the Netherlands to attend the DCC Cyber Security Insight Course (CSIC). Previously members of the CCOE, the CPB, 780th MI Brigade, 781st and 782nd MI Battalions have attended the course. "Sending our cyber workforce to the course is a great professional development opportunity and strengthens our ties with a coalition partner," said Maj. Deon Singh, 781st MI Battalion S3. "The most valuable part of the course is the knowledge obtained regarding the challenges DCC is having in the cyber realm due to their proximity to EU and NATO." Concisely, the 780th MI Brigade leadership see the true value of the CSIC training is in the relationship building and understanding how a coalition partner is handling the problem everyone is currently facing -- security and freedom of operations in the cyberspace domain. At the end of their meeting Folmer and Branch discussed greater engagement and cooperation in future exercises. "What's neat to see is folks take this seriously, they understand the impact (cyber) can have, and the importance that they want to assess towards it," said Branch. "I think Brig. Gen. Folmer's at the cusp of building out his force to support both tactical commanders and strategic-level leaders for the Netherlands."